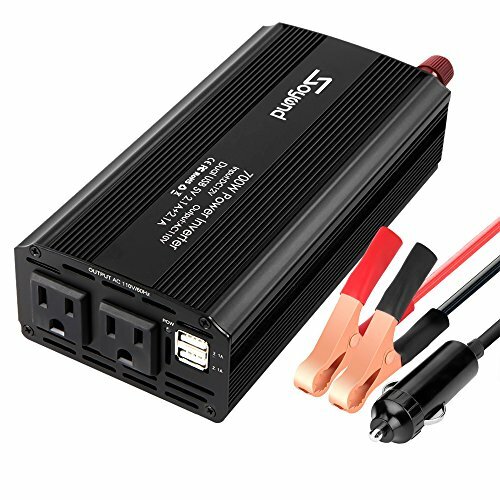 Soyond car power inverter for road trips, vacations, outdoors, emergency kits and more for your vehicle. Develtech has founded the professional technical team to research and develop the most delightful products for our customers. We will keep update our technology and products to offer you the latest technology products. And for every product, we assured not only the quality, but also the support. If you met any technical or quality issues, we will surely help you solve it. For us Develtech, we do nothing but offer you the best buying experience. 【FAST CHARGING】: 700W Inverter with Dual AC outlets for charging laptop, game console, kindle, TV, DVD players.and 2 USB charging ports (2.1A & 2.1A AUTO) Smart matching suitable current great for fast charging iPad, Smartphone. 【Quality Guarantee】: Durable metal housing provides advanced protection from drops and bumps.Integrated cooling fan helps reduce heat and prevents shortages.